Let’s use what we know about parallelograms to find the area of triangles. 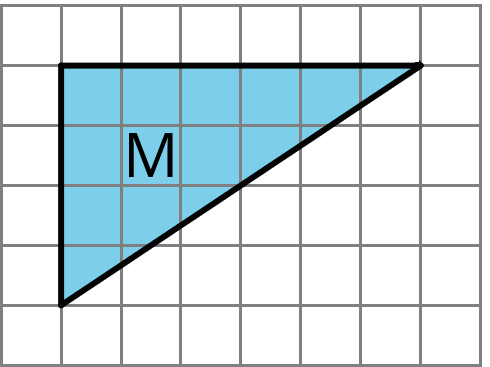 Han made a copy of Triangle M and composed three different parallelograms using the original M and the copy, as shown here. For each parallelogram Han composed, identify a base and a corresponding height, and write the measurements on the drawing. Find the area of each parallelogram Han composed. Show your reasoning. Find the areas of at least two of the triangles below. Show your reasoning. Your teacher will give you two copies of a parallelogram. Glue or tape one copy of your parallelogram here and find its area. Show your reasoning. Decompose the second copy of your parallelogram by cutting along the dotted lines. Take only the small triangle and the trapezoid, and rearrange these two pieces into a different parallelogram. Glue or tape the newly composed parallelogram on your paper. Find the area of the new parallelogram you composed. Show your reasoning. What do you notice about the relationship between the area of this new parallelogram and the original one? How do you think the area of the large triangle compares to that of the new parallelogram: Is it larger, the same, or smaller? Why is that? Glue or tape the remaining large triangle below. Use any part of the work above to help you find its area. Show your reasoning. Can you decompose this triangle and rearrange its parts to form a rectangle? Describe how it could be done. Make a copy of the triangle and join the original and the copy along an edge to create a parallelogram. Because the two triangles have the same area, one copy of the triangle has half the area of that parallelogram. The area of Parallelogram B is 16 square units because the base is 8 units and the height 2 units. The area of Triangle A is half of that, which is 8 square units. The area of Parallelogram D is 24 square units because the base is 4 units and the height 6 units. The area of Triangle C is half of that, which is 12 square units. Decompose the triangle into smaller pieces and compose them into a parallelogram. In the new parallelogram, $b = 6$, $h = 2$, and $6 \boldcdot 2 = 12$, so its area is 12 square units. Because the original triangle and the parallelogram are composed of the same parts, the area of the original triangle is also 12 square units. Draw a rectangle around the triangle. Sometimes the triangle has half of the area of the rectangle. 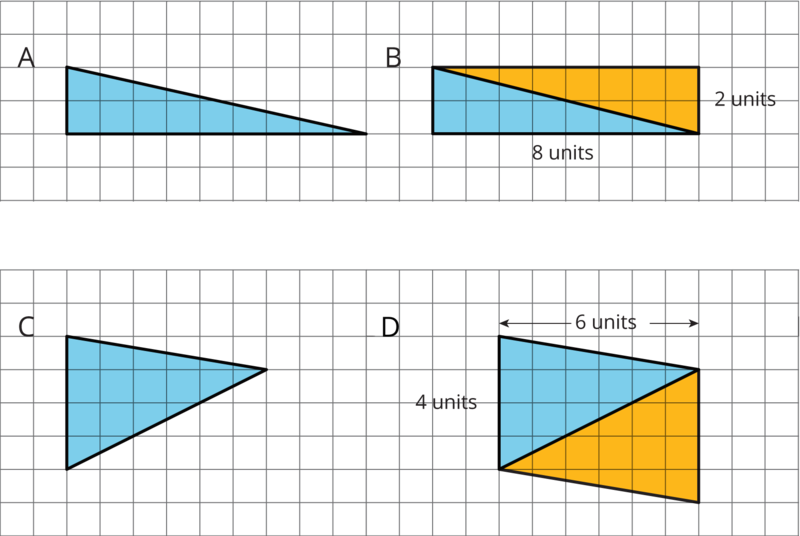 The large rectangle can be decomposed into smaller rectangles. The one on the left has area $4 \boldcdot 3$ or 12 square units; the one on the right has area $2 \boldcdot 3$ or 6 square units. 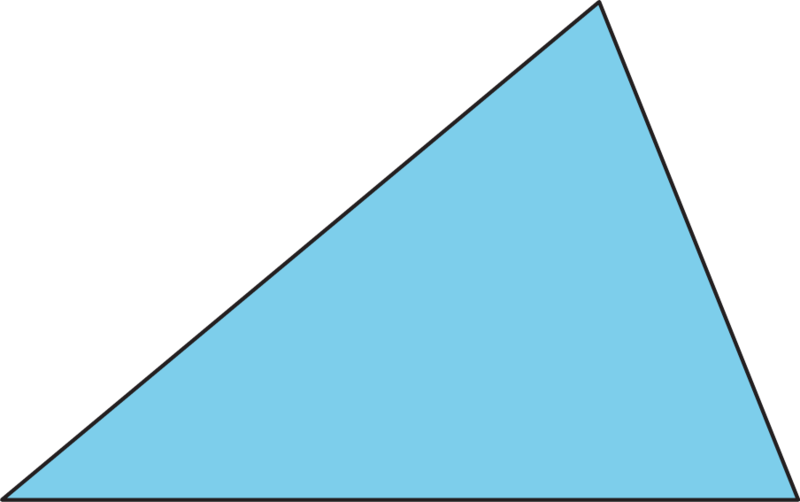 The large triangle is also decomposed into two right triangles. Each of the right triangles is half of a smaller rectangle, so their areas are 6 square units and 3 square units. The large triangle has area 9 square units. 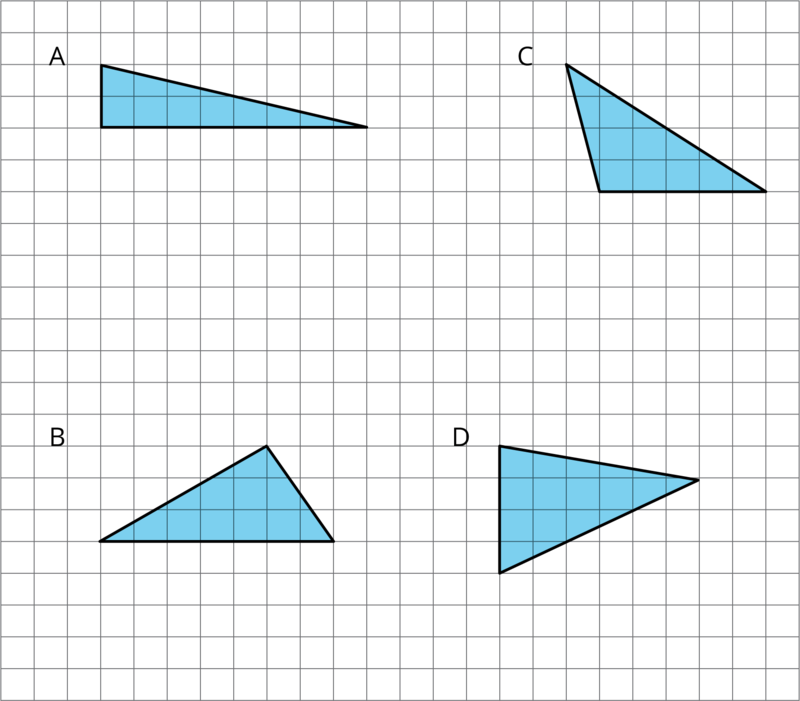 Sometimes, the triangle is half of what is left of the rectangle after removing two copies of the smaller right triangles. The right triangles being removed can be composed into a small rectangle with area $(2 \boldcdot 3)$ square units. What is left is a parallelogram with area $5 \boldcdot 3 - 2 \boldcdot 3$, which equals $15-6$ or 9 square units. Notice that we can compose the same parallelogram with two copies of the original triangle! The original triangle is half of the parallelogram, so its area is $ \frac12 \boldcdot 9$ or 4.5 square units.